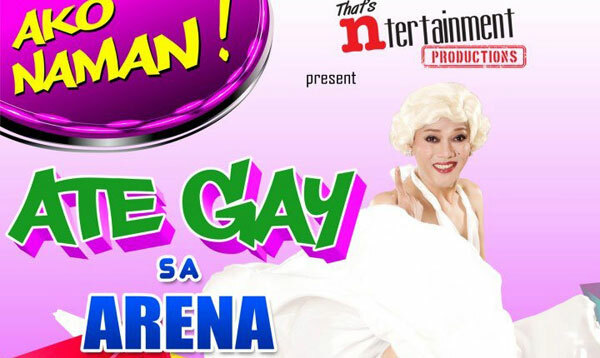 I have always loved Ate Gay and her comedy style. Really Funny and not trying hard and not offensive. I actually have some of her videos downloaded in my PC; her mash-up songs, her classic Ate Guy act and her incredibly out of nowhere declamation. Whenever I’m sad and down, I listen to those. It makes me smile. When I found out he is bringing down Mall of Asia Arena this November 30, 2012 for his first ever major concert; I didn’t hesitate to promote him all heartedly. Like how I have been telling the world of how wonderful he is as a comedian. For sure I won’t miss this big show that will certainly laugh my heart out. Brought to us by That’s Ntertainment Productions; Directed by Philip Lazaro and Andrew de Real with special performers of The Company, Aiza Seguerra, Aegis, Anton Diva, Allan K, X-Factor Finalists, John “Sweet” Lapus, SexBomb; the real Superstar, Ms. Nora Aunor. Take time to watch this video first so you’ll know what I’m saying!